Still, they're not so bad that you can't tell what we've found this week (thank you Photoshop). With winter upon us we've been inundated with people wanting advice about the best 4x4s on the market. And when it comes to a small and affordable 4x4 we think the Fiat Panda Cross fits the bill perfectly. The Panda Cross is a posher and chunkier version of the Panda 4x4. You can of course get a standard Panda 4x4 for this money, but we think the Cross, with it's beefed-up styling, is the one to go for. There aren't many around - in fact this was one of only two for less than £5k - so you may have to be patient for the right car to come along. We found a 2008 model with 70,000 miles on at £4,795 which has, according to the seller, had just one owner from new. There's no mention of what service history it has, so that will be the first question to ask. 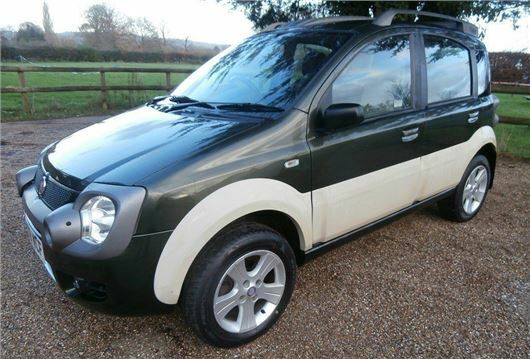 It does however come in the good-looking 'Rain Dance' Green paintwork which was a new colour for the Panda Cross. Powered by Fiat's 1.3 MultiJet diesel engine, the Panda Cross is not a quick car. The little diesel engine produces just 70PS and a modest 145Nm of torque so acceleration from 0-62mph takes what can only be described as a 'leisurely' 18 seconds. Still, it's slightly quicker than the Panda 4x4 1.2 8v petrol which takes another 2.0 seconds. The Panda Cross came as standard on 185/65 x 14 tyres or there was the option of 185/70 x 14 Mud and Snow tyres. With the latter, the little Fiat is perfect in the snow, helped by good ground clearance and a light kerb weight - less than one tonne. This example looks in good nick and is unlikely to have been anywhere seriously off-road. The 15-inch alloy wheels are in good condition and the cream side panels look unmarked. Similarly the interior looks well cared for, although it's difficult to tell due to the quality of the pictures. A thorough inspection is certainly recommended. Fiat may traditionally not have the best reputation for reliability but the Panda has proved reasonably robust. That said you do have to watch out for a few things. Power steering column motor failures have become increasingly common and the clutch master cylinder is prone to eventual failure. The handbrake cables can be worn where they pass along the rear suspension arm too. As for running costs, you'll be looking at £130 annual road tax and while claimed economy is 54.3mpg Real MPG users are showing that you'll get pretty close to that with an impressive 49.0mpg in real world driving - that's a better real-to-claimed ratio than most other small 4x4s. So it may not impress the neighbours much but the Panda Cross is a car with hidden talents. Dependable, rugged and cheap to run, it's the ideal small 4x4.